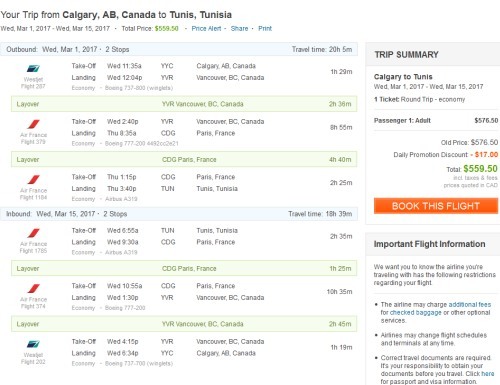 KLM and Air France dropped the prices from Calgary to virtually everywhere they fly in Europe, Tunisia, and Morocco down into the $500s roundtrip including taxes today. example: Calgary - Barcelona, Spain for $621 CAD roundtrip including taxes. Or Calgary to Athens, Greece for $675 roundtrip. May 17 to 31, 2017. I'm not sure if Flight Centre is able to book the late May / June 2017 flights or not. Their online calendar does not go that far ahead, but perhaps it's possible over the phone. Air Canada has dropped their non-stop flights from Calgary to London (LHR), England down to $599 CAD roundtrip including taxes in September and October 2016. With the Flight Centre promo, it should be possible to book these flights for $499. Non-stop flights from Calgary to Amsterdam, Netherlands for $550 CAD roundtrip including taxes are available in late August, September, October, November, and December 2016. And January to March 2017. With the Flight Centre promo, it should be possible to book these flights for $450. At the moment, relatively low prices in the $400s and $500s roundtrip are still verifying on Expedia from Calgary to Barcelona. The situation may be the same for other destinations. This likely won't last too much longer! 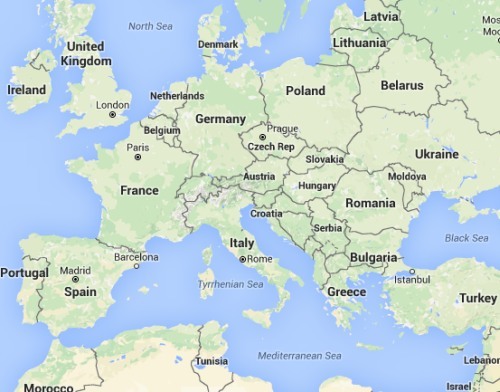 23 Responses to "Madness from Calgary to Europe, Tunisia, and Morocco! Insane prices to many, many places in the $400s and $500s roundtrip including taxes"
How can we get deals for a specific country?. Example England? It seems as though none of these prices are available in winter 2017? Google Flights won't let me look past May 2017 for any of the destinations and at that point the prices are all normal. It would be terrific to book this for next year at this price. Would anyone have any suggestions for how I can do this? Specifically for Serbia in Winter 2017? Just booked Calgary Barcelona Madrid Calgary for $523 per person. Amazing. Thanks YYCDEALS Calgary. Costs about same to fly Calgary Toronto summertime. Flying KLM Airlines end of August to mid September. None of these places work for 2017 - any help would be great. Yes this deal is still on for 2017 as well! This is obviously misleading advertising! I called Flight Centre and apparently the $100 off is departure location specific, so from Calgary I was not able to get the promotion. I still booked anyway for Feb 2017, $466 RT from YYC to Barcelona. Thanks for letting me know. That's strange, I've had a few Flight Centre reps tell me that their offer is available from all Canadian departure cities. I'll look into it. Haha looks like flightcentre is running their show with a bunch of cowboys! I am currently battling it out with a bunch of reps to waive their 20$ booking fee. Lindsey, I will post my final pirce here but I am positive barcelona should get the discount so the final price would be 366$ !! "Flights to Barcelona out of YYC would definitely be $100 off. Can they contact me and I will sort them out..."
Thank you, Chris! Nat in Vancouver got it all sorted out for me, and even improved my itinerary, so now I'm rebooked for $366 RT! Lindsay, what dates in Feb did you book? I just called and they quoted me over $700. Ugh! Booked Calgary to Dublin Oct. 19 - Nov. 2, $361.24 ($722.48 for 2 - ALL IN!!) with the $100 discount applied!! Awesome deal and thanks for the Alert YYC Deals!! Do you have to call Star Alliance to match? It appears Star Alliance has not matched the sale, or at least for Paris and Rome. Some agents are charging 20$ booking fee and some are not. 'Flight Centre Kensington' in Calgary doesn't charge the booking fee fyi. Good to know, thanks Harsha! Excellent, thanks Steve! Have a great time in Spain! Hello Chris. I think, I rest on our laurels and the promotion is gone now. Do you know when they are going low again? Yes, unfortunately the fares went back up last night. I wish that they could be predicted, I would certainly love to blog about upcoming price drops. This was a pretty unprecedented event, and hasn't really happened before, with such a large number of European destinations dropping so low at once, from virtually every airport in Canada. It's hard to say when to expect it again! we missed it i cant believe it...was just trying to see if we could get a flight in and out of africa to see our son...from barcelona we had decided to do it and now its gone...boo hooo ges we wait for the next good deal. Do you think Calgary will offer up some good deals when the new airport opens? If there's one factor that directly relates to how many great airfare deals that a particular city sees, it would be the number of airlines serving it. If the new terminal helps bring in any new airlines, it will definitely lead to more deals in the future.